A second round of updates for March for both the topographic and the imagery base maps. User contributed content improves the map that all users can benefit from. Building a topographic map that covers the entire country, let alone the world, was never a matter of simply gathering and processing the data and generating a map from that data. It is, and always will be, a work in progress, a series of big improvements and small, incremental changes, some of them hardly noticeable. Last week I wrote about some of the small updates that were made to the imagery and topographic base maps. This week there are more such changes, but these are a little more obvious, even if it is only at the local scale. First, the image map updates: two small communities contributed their imagery towards improving the imagery base map. Magog, QC provided 10 cm imagery from 2012 and Mono, ON provided 20 cm imagery from 2010. Both of these are viewable from 1:36,112 to 1:1,128. For our topographic base map updates, we start our tour in eastern Canada where some of the bigger changes have occurred. The Province of Nova Scotia has contributed its data to the topographic base map. Before this update, federal government data was used to map the province. As the illustration below shows, the province has richer and more detailed data. As well as the addition of a more detailed buildings layer, there have been other enhancements to the map, including more accurate roads, vegetation, contours and water layers. The entire province has been cached to 1:1,128 and includes integrated data contributions from the Cape Breton Regional Municipality, an existing Community Maps contributor. A comparison of the previous version of the topographic base map with the new, current one that shows content coming from the Province of Nova Scotia. The next new contributor to the program is also in Nova Scotia. The Regional Municipality of Halifax has an extensive open data site which we drew on. With access to both provincial and municipal data, we had to pick and choose and make our judgement as to which layers should be used to produce the best possible map. The end result is a vastly improved and more detailed map. The update for Halifax, NS includes both provincial and municipal data contributions. Our next stop is in Ontario where we accessed two open data sites, the Town of Oakville and the Region of Waterloo, to improve the topographic base map. Both municipalities have rich data collections that we attained, used and supplemented with data coming from the Province of Ontario. 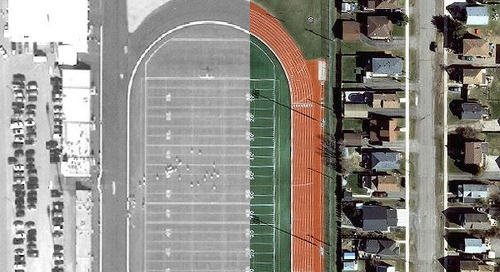 The before-and-after images illustrate the significant improvements that have been made to the map as a result. Both municipal and provincial data were used to update the map for Oakville, ON. The community of St. Jacob's in the Region of Waterloo, ON comes alive with new data contributions from the Province and the Region. Jumping over a few provinces to Alberta, we recently published data from three new contributors. Both Sturgeon County and The City of Lethbridge provided the Community Maps Program with new data. In the maps below, notice the changes in the old and new versions for both communities. In the case of Lethbridge, more detailed contours results in a much improved hillshade. With the addition of buildings, better roads and improved vegetation, the resulting map is a much richer product. The gains in quality are noticeable even at the large scale the Sturgeon County map is displayed. Addresses, parcels (provided by AltaLIS) and buildings provide new information where nothing existed before. Buildings, contours and hillshading are just some of the improvements made to the topographic base map in Lethbridge, AB. Sturgeon County, AB provided contours, addresses and buildings; AltaLIS provided parcel boundaries. Together they've improved the quality of the map. We accessed additional topographic data from a third municipality, the City of Calgary, through its open data site. Even a small change, such as the replacement of the federal water layer with the one provided by the municipality, makes a noticeable improvement to the map. Calgary, a fast growing community, is already noticeably out of date and will be refreshed with additional road data in the near future – a reminder that the topographic base map is a continual work in progress. It's hard to keep up with the changes in Calgary, AB, but every little bit helps. Corrected water features and parks are some of the items that have been updated for the map in Calgary. Our last stop is in the interior of British Columbia. The City Kelowna joined the Community Maps Program and finally has its data published in the topographic base map. Many of its data contributions are available through its open data site. Here, less accurate and up-to-date federal data has been replaced with municipal data, each layer making the map slightly better. A great hillshade in Kelowna, BC. Parcels and a proper vegetation layer make the map look alot better. To see what is currently available and what's being worked on, check out our Community Maps Status Map for Canada.